Sen. Tom Saviello, left, provides testimony to the Maine Public Utilities Commission, at right, in September 2018. AUGUSTA - The Central Maine Power's New England Clean Energy Connect project advanced through an initial permitting process Thursday, with the Maine Public Utilities Commission agreeing to issue the $1 billion project a Certificate of Public Convenience and Necessity. The project would create a 145-mile, Direct Current transmission line with 1,200 megawatt capacity that would link Canadian hydro power to the New England grid via a converter station in Lewiston. In Franklin County, new corridor would enter northern Franklin County in Beattie Township, passing through Lowelltown and Skinner Township before crossing into Somerset County to the east. When the line reentered Franklin County in Industry at the Starks town line, it would run within the existing transmission corridor through six municipalities: Industry, New Sharon, Farmington, Wilton, Chesterville and Jay. In total, the project would create 53 miles of new corridor in Maine. In addition to the 145-mile long DC line, there would be 44 miles of AC line improvements in southern Maine, as well as infrastructure installed at the Lewiston station. One of the first approvals CMP sought was the MPUC certificate, which requires a finding by the three commissioners that the NECEC's benefits to Mainers would outweigh its costs. Last month, MPUC's staff issued an Examiner's Report that recommended the commissioners allow the project to go forward. While that recommendation was made independent to consideration of the February stipulation that included $258 million in incentives over a 40-year period, that stipulation was also accepted. At a meeting today in Augusta, all three commissioners voted to grant the certificate. "This project has significant benefits for the people of Maine," Commission Chairman Mark Vannoy said. Benefits listed by the commissioners include improving the reliability of the electric system, mitigating fuel security concerns and reducing Maine electricity costs. The commissioners also cited the stipulation incentives as benefiting Maine communities and environment. Those benefits outweighed potential impact to scenic and recreational values, commissioners said. CMP President and CEO Doug Herling welcomed the decision, saying that MPUC had given "due consideration to all perspectives." "We are thrilled that the Commission has voted in favor of this project. This approval marks a major milestone for the NECEC and for the region’s efforts to secure a future of clean, reliable energy," Herling said as part of a prepared statement released Thursday. "Today’s decision confirms the New England Clean Energy Connect will deliver environmental, economic, energy security, and other benefits for Maine and for consumers throughout New England." Opponents of the project denounced the ruling, with NO to NECEC Director Sandi Howard saying in a statement that the siding of "corporate utility lobbyists against the clear will of the Maine people" had been anticipated. The MPUC had ignored public comments rejecting the project, towns that had moved to oppose NECEC and state-wide opposition, Howard said. "Regulators are supposed to protect the interests of Mainers, but it is clear that did not happen at the PUC," Howard said. MPUC had sided with corporate interests over those of Mainers, Sue Ely, a Staff Attorney at the Natural Resources Council of Maine, said in a statement. The decision understated the damage to the North Woods, the negative impact on local clean energy projects and the project's inability that it would benefit the climate, Ely said. "At every juncture, Mainers have voiced their overwhelming opposition to this project, and we are confident that they will continue to do so during the multiple permitting processes that still lie ahead for the project," Ely said. The next regulatory step would be Maine Department of Environmental Protection and Land Use Planning Commission approval. 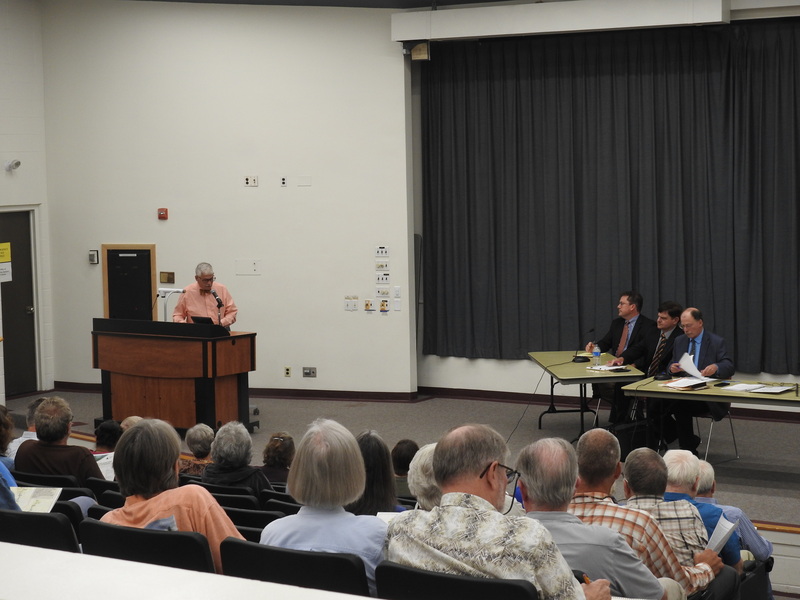 Joint hearings were held earlier this month in Farmington and that process is expected to take several weeks to complete. Federal permitting is also required, and there is a public utility approval process that also must take place in Massachusetts. The project delivery date is in 2022. Additionally, bills submitted to the Maine State Legislature would impact NECEC if they were passed into law. These include LD 640, which would mandate an analysis of the project's emissions impact as part of the MDEP's approval process, and another bill that would require that towns along the line approve the project locally. No surprise here but this is far from a done deal. Keep up the involvement every step of the way. It's a worthy cause to oppose this. Thank you to those who are handling all this in good faith with your eyes wide open. NOOOOOOO, we have to stop this it is a disgrace, a facing of our state, and we get NOTHING out of it. Why do you think 2 other States said NO. Stay involved and just say NO. Go away. You give us nothing. Smile all the way to the back while shafting us. No it's not over, but it's soooo close. Pretty soon all of new England will benefit from cleaner Greener hydro power from Quebec. The more people who look at facts and not fiction, the more support the NECEC will get. Who is the land is it ? Are they Buying the land or taking the land how is it all going down. Mr. Herling is thrilled, the majority of Maine citizens are not. The MPUC certainly missed the boat on considering them. More smoke up the skirts of Maine. We are Sooooo close to paradise. Maine, the way the big money tells it to be. By the time we have 100 more wind turbines to enjoy,, we'll be completely controlled by big out of state money. I'm sure they'll have "our" best interest in mind,, right? This is what Democrats do when they take over your state...they don't listen a bit to the people who live there, they think they know what's best for you, and forge ahead with their agenda (to bring many many more from CT, MA and NY here). THEY are in control now, not citizens, oh no. Now you know what "over regulation" is. It's just getting started (hope you're current on your shots). Heck, a good number of you won't even live here much longer, so why get all bothered, anyway? Your taxes just skyrocketed, and you don't even know it yet, lol. Sorry - elections have consequences. Better luck in ~18 mos, maybe people will be in enough pain to actually VOTE next time. So much for your girl's 'small town values', he he he! Well said silly boy. The new guvna has already spent a big chunk of our rainy day fund. Good luck with our bond rating. Screw the roads but at least more people will be getting free health care and some places to plug their cars in. No surprise. It's just like the rubber stamping of the wind projects. The naysayers and nimbyites would relegate Maine back to the 19th century..... keep Maine as a backwater state. Maine is competing for businesses with the rest of New England and the rest of the country. Maine cannot keep putting barriers up for improved infrastructure and still expect high quality jobs/businesses to migrate here. Don't expect me to respond to the inane, emotional and uninformed comments that will surely follow this unpopular viewpoint. How can this be seen as a political issue? I agree in most ways the new Democrat rule is going to run our state into the ground. They already started. PUC decision was made long ago, as CMP lawyers know exactly how to cross the t's and dot the i's, and the PUC is spineless. CMP has been buying up land and establishing leases and buying swamp matts and paying for surveyors for a long time now, as they also expect this to slide right through. After all, thats the way its always been done- bribes and back room deals. The problem for CMP this time is that we exposed their antics and are shining the light of day on it. Maine people are smart when they are informed! OverRegulated- this is not a partisan issue its a Maine issue. Eddie, your condescending attitude towards the majority mimics what we have been seeing from CMP reps all along. I continue to thank them (and you) for treating us as if we were ignorant uninformed hicks. It really is our best PR. PS: Quebec Hydro is not only dirty power, they are Quebec First. Maine should have a consortium of our brightest minds brought together to have a clear and concise energy policy- that benefits Maine. Eddie, something as huge and controversial as the NECEC always becomes political. Red, CMP owns the land but has made it perfectly clear that if they have to reroute for any reason, they’ll take land by eminent domain. Kinda a damn if you do and damn if you don’t. I’m still struggling with the concept. Also a big thanks to Starks. You had a great meeting last night. It was certainly heartfelt and difficult. @ Terry. The Starks meeting exemplified what is wrong with this debate. Almost all of the arguments against it were emotional. We had Tom Saviello angrily making accusations like he was some sort of an expert witness. Why was he even there? Paul Fredericks and Jen Hebert made the most convincing case and people shrugged them off. Never let facts get in the way of a good story I guess. But when someone claimed the lemon stream was going to be polluted people cheered him on. Wait a minute folks the power line has crossed the lemon stream since 1930 and its not polluted yet. Do you think another wire is going to change that? 45 of Starks voters bought the line dragged in front of them. I love my town, but sometimes jeesh, they just make me shake my head. Eddie, Clean power? So much of what happened to the native Americans in the 1700s, 1800s and 1900s in the US has been done to the Cree in Quebec in MODERN TIMES! (since late 60s). Their lands, hunting grounds, original towns, their culture and way of life devastated. Massive environmental damage all over Quebec from an endless push for more and more hydro which is still going on! All stuff that wouldn't even be allowed in this country. Wake up please, look into it. Criminal. And think of the absolutely massive amounts of fossil fuels needed to build these mega projects. People like the label of "clean power" because then they don't have to really look at the issues. EVERY source of power has advantages and disadvantages. Jim, the line dragged in front of them? there were 6 professional speakers provided by CMP, a powerpoint presentation and life sized displays. Are you literally calling the majority of the people there last night stupid and unable to reason critically for themselves? Perhaps you should, ahem, check yourself. Curmudgeon, I usually do not agree with you but on this one, we are in agreement. Also, why are people blaming this on the Democrats. LePage wanted to bring energy costs down and make Maine more business friendly. This is a move in that direction. It is not a political issue, it is a future of the state's economy issue. This is opposed for all the wrong reasons. If people here care about the environment, then outlaw smoking, alcohol (how many fireball nip bottles will I step on as the snow melts), wood burning stoves, paper mills. large engine vehicles (pickup trucks, SUVS, mini vans) etc. These are all pollutants that hurt our overall health and are a blight on the eyes. A power line is overhead and we already have gotten sued to these. If this were for Maine CMP customers, there would be far less opposition. I am not holding my breath for the water powered wheels to run the mills and drive the great economic engine here. The views we enjoy will still be world class. And, for the record, I fully support wind turbines off of Cape Cod as well. Don't put words in my mouth. We are not stupid in starks. I said emotional. The people at the meeting had their minds made up when that got there. The group's opposed to this project have spread some pretty crazy ideas and falshoods. But they have done it so well that there's a segment of the population that isn't listening anymore. Doesn't make them stupid just closed minded. And unwilling to listen anymore. You remember the Hospice Nurse don't you? The one that apologized for being late to the meeting because she had just worked 14 hours. Jim, if that Corridor goes through as planned its going to ruin everything that makes her home, a home. Shes earned it Jim, if anyone has earned it, it's her. And you know what Jim, those CMP folks knew it too. The majority of them just looked down at the ground and that's the first time I've ever seen that, with this group. I almost felt sorry for the CMP Representative that tried to make it all go away with a picture slide. He failed miserably and he knew it. Jim, I'm opposed to this project and I'll use her testimony and spread it to the High Heavens. Crazy ideas and falsehoods you say? You see, somethings just can't be explained away with numbers, studies, and picture slides. And somethings,including some people, can't be bought with money. You can't pay them enough to give up what is theirs, unless you use eminent domain, of course, then they don't have a choice. Crazy ideas and falsehoods you say? Jim, you did a fine job last night presenting your side, as did all the others, pro or con. That's what makes a debate, a debate. I'm sure I didn't change your mind, nor did I change the mind of a Select-board member from Jay last night. But hey, no matter the grumblings each of us uttered, we managed to sit side by side, pro and con, by choice. And just because neither of us changed our minds, it didn't mean we weren't listening to the other side. @curmudgeon, please, don't feel the need to respond. Perhaps it would be better if you didn't. Have a nice night. Can someone please tell me the benefits of this projects for Mainers? I haven't heard a single thing about how it's going to benefit us. Plenty of generalities, 40 years of what lower power bills from the company in Connecticut that cares so much about Maine. I doubt that! Six cents a year savings on our power bills. Sure let big money have all that land Janet Mills Mainers appreciate you looking out for our interests. It's more than clear the people of Maine don't want this!! Linda, every town along the line will benefit on their tax bills. For example, CMP pays over 30% of Starks entire tax bill. After the upgrade they will pay 50%. Nobody is letting CMP have any land, they already own it. Greed and politics as usual versus the environment and what is unique about Maine. Once you realize there is no actual reduction of global greenhouse gas emissions, yet the Maine environment suffers, it should be a no brainier. It's a bad deal for Maine. Follow the money and alsk yourself, do you trust CMP? Jim just told me that once this corridor goes through my property taxes in Starks will be reduced by 20%. No, I said cmp's contribution to the total will go up that much. How the people in Starks choose to spend it is up to them by a vote at the annual town meeting. That's how it works. See, those are facts not what ifs and maybes. Oh, I see, you said " CMP pays over 30% of Starks entire tax bill. After the upgrade they will pay 50%." Sorry, I must have misunderstood. I missed the contribution part. We will all be able to plug in our electric cars in remote areas of Maine. Who is THE PUC? 3 men, two who aren't Mainers by birth nor philosophy. NONE of them live in the area effected by the Power Line. "For the good of the whole state" was the quote. That means York and CUMBERLAND county, the Democratic strong-hold. Want to have YOUR say? Contact them. There's a "contract us" button on their website. Overload their email. Kick 'em in the shins with your words. Maybe, just maybe we'll get through to them. First time ever....I agree with Nancy Porter!! Nancy, when the PUC stated, "you need to think beyond the local impact" you can be sure that is exactly what they were doing. Disregarding Maine's best interest for Quebec, Massachusetts and Spain. Don't think for 1 second this is not 100% about money, it is not now nor was it ever about the environment. Lets hope the DEP is able to do their job and stop it. 1. How do so many people not understand how electricity works? New England is connected to a grid. Think of it like your house. If I increase or change the source of the power going to your house, doesn't it affect every room? Same idea. Everyone connected to the grid benefits. Of course it's about money fir CMP. They are a for profit company. But if they can get cheaper hydro power from Quebec, that benefits everyone. In Maine we have a habit of voting to raise our taxes pretty consistently, let's break the trend and support something that will actually lower then. Or at least offset the next bond question that gets approved. I KNOW it's all about the MONEY! So who is going to benefit? Not the Maine consumers, for sure. Select consumers, I'm sure, but NOT the general populace. All three commissioners were appointed by LePage. I doubt they are Democrats. Working for the good of large corporations is not a Democrat agenda. Odd. Tom if dems didn’t work in favor of big corporations why are most all of our politicians making millions in d.c.? Once again Eddie you don’t understand. Even if this goes through NO ONES BILLS ARE GOING TO BE CHEAPER!!!! CMP isn’t going to drop any of the prices for anyone so explain again how this benefits anyone but CMP !!! It will not reduce greenhouse gases by clearing more land, and please explain where fossil fuels are used in Maine to produce electricity besides the one natural gas plant in Veazie.